I’m from Garden City Kansas, which is an hour from the Colorado border and an hour from the Oklahoma border. 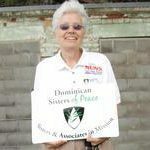 There I am involved in the Dominican Sisters Ministry of Presence, which is a direct ministry with the economic poor. In our town of 30,000, we are majority minority and those people come from 25 different countries. We have children born in 25 different countries in our school district. They speak over 37 languages because of all the dialects. When I first went there, we were serving a majority of Spanish-speaking in the ministry with the poor. Now, it’s majority Anglo, English-speaking people because of the economy of our country and of our state. The latest newly poor people are those that had been working in the oil industry and have been laid off because of the cut back on it. We have refugees coming from Ethiopia, Somalia, Burma and so forth so it’s a very mixed-type of situation. The reason for them being out in the middle of nowhere in Western Kansas is because of the job market in the dairy industry and the beef-packing plants and all the other jobs that go with them. Our ministry with the poor allows us to be in the homes, with the families, and so we see life from their side of the story. Like the man who, with tears in his eyes said, “I don’t want my children to hear me asking for help. I’ve never had to in my life. Now I don’t have the ability to pay my light bill.” Then you have people who are saying “People are poor because they want to be. It’s their choice. They’re on welfare because of that.” You just need to bring this type of the story so that they know it’s very real that people aren’t choosing it. This is the first time in their lives that they are poor or they’ve had a major medical problem in the family and they aren’t qualified for getting healthcare. It’s an endless black hole for them.